Arlington’s FLBT6520 series Countertop BOX KITS have round plastic boxes with round metal trapdoor covers. They deliver a great looking, NO GLUE installation with three options for installing a UL Listed 20 amp device in a countertop. Get your kit with an installed tamper resistant decorator-style GFCI... a tamper resistant receptacle... or a tamper resistant receptacle with two USB ports! The ROUND gasketed, brass or nickel-plated TRAPDOOR COVERS not only look great but also cover miscut openings. The round shape also allows for positioning the assembly parallel with the countertop and backsplash! Covers close flush with the countertop, preventing damage to the devices in the box. The steel spring clip holds the plastic box securely against the surface when the screws are tightened. It’s also ‘bendable’ so it’s easy to insert into the opening in the countertop. 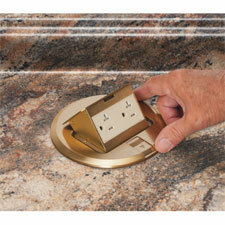 Arlington’s Countertop BOX KITS fit granite or other countertop material up to 1-1/2" thick. They comply with NEC section 406.5 (E) for use in countertops or similar work surfaces.